The Brown Bunny "77" T-Shirt in black , size medium. 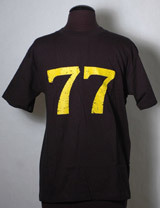 Large "77" printed on front of t-shirt, in yellow with "road effect." Back reads "Bud Clay 77 The Brown Bunny." Label reads "To Daisy From Bud The Brown Bunny."